SOLD - PAINTING NO LONGER AVAILABLE. 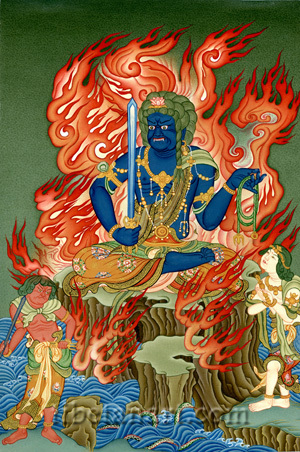 Acalanatha, the 'immutable lord', is a wrathful protector and knowledge-holder (vidyadhara), who is known as Fudo Myo or Joju Kongo in Japanese Buddhism, and as Budong Fo in Chinese Buddhism. He is fierce and blue-black in colour, and he sits in vajra-posture on the summit of Mt Meru, which is represented here as a vajra-rock formation surrounded by a turbulent ocean infested with naga-serpents. His face has a fierce and frowning expression with two bulging eyes, and he bites down upon his lower lip with his two sharp fangs pointing downward. His tawny hair is coiled upon his head, with one twisted lock falling to his left shoulder, and his head is crowned with a pink lotus. As ornaments he wears golden earrings and bracelets, armlets that are adorned with silk ribbons, and necklaces of gold and pearls. His lower garments are fashioned from colourful embroidered silks that are fastened with a silk belt, and he wears a red silk shawl that is draped across his left shoulder. With his right hand he holds a double-edged iron sword with a vajra handle, and with his left hand he holds a coiled rope-noose that is sealed at its ends with a vajra and a ring. He is surrounded by a blazing mass of wisdom fire, which annihilates all defilements. Standing on a rock formation to his left is his attendant Kongara Doji (Skt. Kinkara), who is peaceful, youthful and white in colour. A golden tiara binds his brown hair, and he wears golden ornaments, lower garments of multicoloured silks, and a red silk shawl that is draped over his left shoulder. With his two hands palms-folded in anjali-mudra he holds a single-pointed golden vajra beneath his two thumbs. And standing to Acala's right is his attendant Seitaka Doji (Skt. Chetaka), who is youthful, slightly wrathful and red in colour. He wears golden bracelets, armlets and anklets, lower garments of embroidered silk that are fastened by a yellow belt, and a pale yellow shawl is tied around his shoulders. With his right hand he holds an iron staff with a pointed tip, and with his left hand he holds a golden three-pointed vajra.